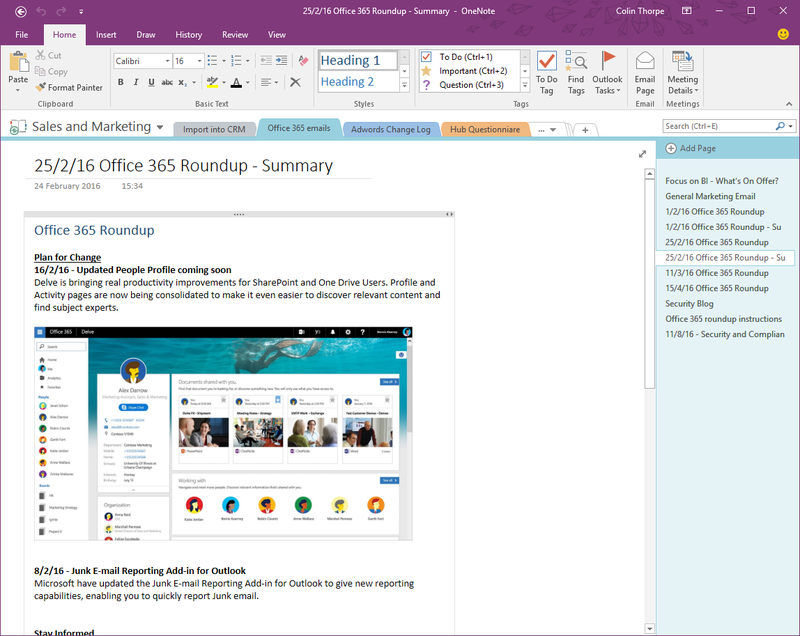 BlogHome » News » News » 60 Second Briefing – What is OneNote? If you’ve been using OneDrive or SharePoint for a while, you may well have noticed a link to OneNote. OneNote is a quick and easy place to write notes, create lists or share ideas. It is very simple to use, and anything that you write is automatically saved – there is no ‘save’ button – so you won’t be losing anything that you add. OneNote files are organised into Sections and Pages. Sections appear as Tabs across the top, and you can add any number of pages into each section. When you add a page, simply typing the title at the top of the page will give it a name, and then you just type away. All changes are stored in the version history of each page, so if you overwrite something, you can quickly get back to a previous version. If you are using a tablet, you can doodle or write directly onto the page. There are lots of nice formatting features on the Ribbon. You can quickly tag your lists with To Do check boxes, Important or Question symbols, Idea, Password, Critical and so on. It also integrated with Outlook, so if you tag a To Do item as an Outlook Task, it will appear in your task list. If you are using your browser for SharePoint or OneDrive, you can open a OneNote file using the OneNote Web App. This gives very similar functionality to the OneNote desktop app, and it also saves the file as you type, protecting you against accidentally losing data. OneNote is one of Office 365’s gems, and is well worth taking a look if you want to reduce the amount of paper sitting on your desk! Click here to go to the Microsoft OneNote Website to find out more. next post: 60 Second Briefing – What is Delve?